RAF FULBECK, LINCOLNSHIRE. WINTER 1944. Moonlight shafts stream in from the roof-lights of No.3 Hangar RAF Fulbeck 1944. On every RAF Bomber Command station there is 3-Hangar. Reserved as far as possible, to receive the worst of the returned crippled and damaged aircraft from night ops, often with dead and seriously wounded aircrew aboard, the aircraft were quickly, quietly brought in to this hangar on their immediate return, out of sight of other aircrews and station personnel. Ground crews were paid an extra 6 shillings a day (30p) if they volunteered for “Sanitation Duty” the gruesome, yet necessary task of hosing out the remains of the fallen, wash away the blood and clean up the interior spaces before a thorough inspection and damage assessment, to repair or scrap “Off Charge” could be made. 1944 was a time when German resistance, their flak batteries and nightfighter defences were still as murderously fierce as ever. Over 95 aircraft were lost in a single night’s operation over Nuremberg earlier that year. 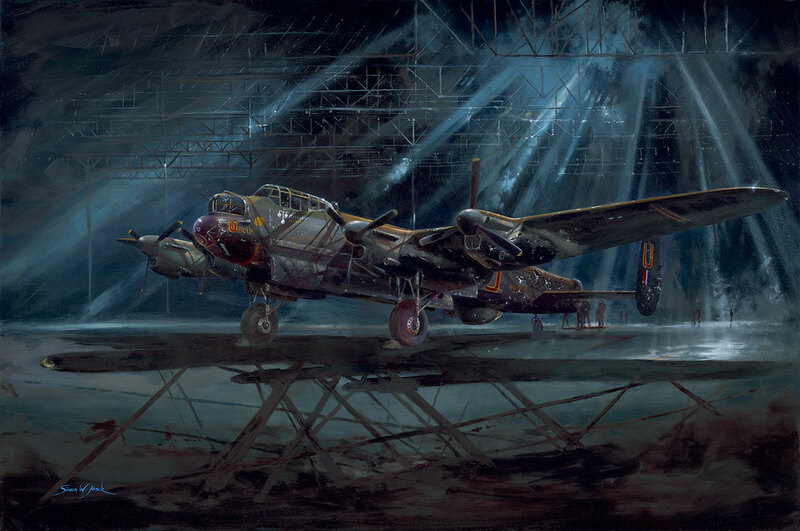 In the painting is U-Uncle, a 189 Sqn Lancaster that had been based at RAF Fulbeck since the Squadron located there in November 1944. She has just been brought in after landing back from her encounter with enemy flak over the target; still simmering and sending smoke and rain-steam from her fire-damaged port outer Merlin swirling into the moonbeams. A JU88 Nightfighter attack over the Dutch coast on the return flight almost finished her off. Her flanks raked and torn with shrapnel and 30mm canon fire. A group of airmen gather ominously at her shattered rear turret. One of these airmen has a blanket and there is a stretcher waiting on the floor. It is a miracle her Australian Skipper managed to bring her home with anyone alive on board at all. This Lancaster’s war is over, as it was for two of her crew. Removed to the Station Mortuary and later buried in the local churchyard with honours and a rifle salute. U-Uncle was stripped for usable spares; to fly again as components within a newly refurbished aircraft and the rest of her scrapped Off Charge. With a replacement Tail Gunner and Wireless Operator her crew will reform and fly again in a brand new aircraft fresh off the line at Avro. Or possibly another veteran ‘kite’ salvaged and restored from spares and new assemblies gleaned this way. The spirit of one other, less-fortunate ‘Lanc and her old crew made anew into another. 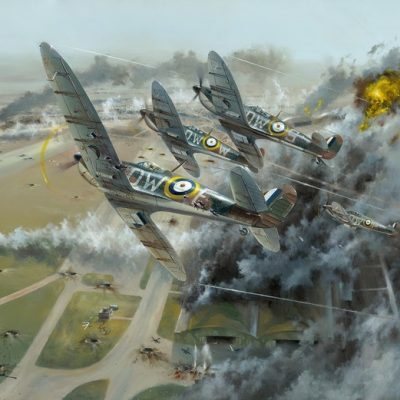 Bomber Command Operations from RAF Fulbeck alone cost the unit 38 Lancasters and their crews, either failing to return or destroyed in crashes. To say nothing of the “Returned damaged” such as this aircraft did. This is the dark, unpleasant reality of life and death on an operational Bomber squadron during the second world war.